Newswise — NEW BRUNSWICK N.J. – The Engineering Research Center for Structured Organic Particulate Systems (C-SOPS), based at the Rutgers School of Engineering, and Thermo Fisher Scientific have collaborated to accelerate the university’s ongoing research on continuous manufacturing techniques for pharmaceutical discovery. With support from Thermo Fisher Scientific, C-SOPS has obtained the Pharma 11 twin screw extruder/granulator, which will be used for testing of hot melt extrusion (HME) and wet granulation processes in continuous manufacturing. The equipment will be housed at the center’s full production-scale continuous direct compression solid oral dosage manufacturing facilities. Researchers at C-SOPS will focus on developing polymer selection criteria for HME tamper resistant and sustained release formulation science. They also will explore twin screw granulation formulation science with an emphasis on understanding binder time scales because those from batch applications are often not relevant. 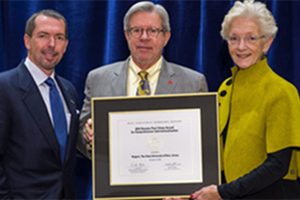 University received Sen. Paul Simon Award for its innovative and comprehensive approach to international education.